This Purple and Black Bag is spacious and great looking, an eye catcher that you will love wearing. The Purple leather is an Ostrich print on cowhide in a rich and beautiful shade. The Black leather is one of our favorites, plonget cowhide, extremely durable but soooo soft to the touch. Layers of stitched pieces outline the shape and details, plus the outer edges are piped in the same leather. There is a 2" gusset that allows the bag to expand too. 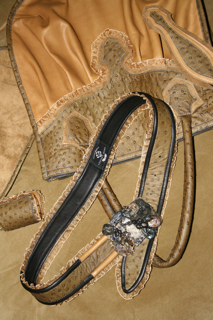 The purse zippers across the top for complete access to the interior with a special piece of artistically crafted leather attached to the closed end. A zipper pull of leather with a large purple bead attaches to the head. A fringed detail on the yokes is comprised of bamboo and tiny seed beads in lavendar. The interior of the bag is fully lined with a paisley print that has a large open pocket on one side and a large zippered pocket on the other. The whole interior is detailed in large matching black leather pieces for durability and strength. The matching belt has rolled-edge piping and is thick because it is made from 3 pieces of leather, the size is 34-37", and can be shortened. The buckle is from our "Relic Belt Buckle Collection", a unique one of a kind piece. The price listed is for both pieces. They can be purchased separately; the Purse for $1200. and the belt for $500. 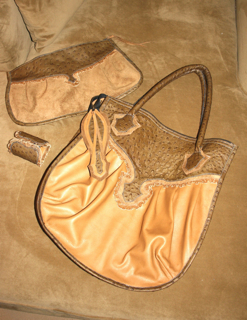 Also shown is the purse and belt in Golden and Olive combination of the same types of leather, this set is sold but can be Custom Ordered.